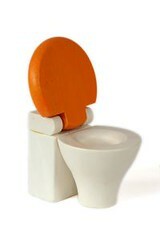 As a way to announce my return to blogging following a brief hiatus, I begin with a post that concerns one of the world's most intractable conflicts (at least since the invention of indoor plumbing): the battle over the positioning of the toilet seat--up or down. Now comes the study that all you gender-conscious game theorists have long been awaiting. From The Science Creative Quarterly is a paper addressing "The Social Norm of Leaving the Toilet Seat Down: A Game Theoretic Analysis", which models the game as a non-cooperative one of conflict (which anyone in a multi-gender household can tell you is a fully accurate representation). We can all hope that researchers may next examine another vexing problem: which way to hang the toilet paper--over or under.